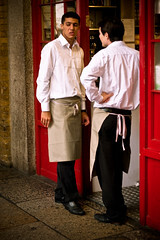 Restaurateur-to-be Bruce Buschel put together a popular list of 100 things he thinks wait staff should never, ever do. Many of these lessons also apply to church ushers and greeters. Here are the ones (in the original order) worth sharing with your welcoming ministry. WRONG! Wear a name tag by all means and introduce yourself if appropriate. Of course, skip the flirting; leave that to the young adults ministry. WRONG! A helping hand or a handshake can be appropriate at times. WRONG! You can display some humanity, but take it easy. 36. Never reek from perfume or cigarettes. People want to smell the food and beverage. Or the incense. WRONG! It’s not insulting, but it is inappropriate. Don’t suggest that what’s on the outside is more important than the inside. WRONG! Kids and seniors are exceptions. Don’t ask for the donation on the way in. That’s my take on the dos and don’ts for ushers from the original list. What are the best ushers at your church doing? Nice parrallel! I am amazed at how effective #1 is. We had a hospitality team at our parish established and it was funny to see the people’s reactions as they entered the Church. They initially avoided the greeters because they thought that they were asking for donations, but when they realized they were just saying hello they were thrilled. Very interesting. Semms like #1 and #49 go together pretty well lol! Our parish council includes a representative from each Mass slot. They also serve as greeters. The arrangement makes it convenient to identify your rep and to bring up a point with them as needed. That’s a good idea. That would solve one of the problems my father-in-law (who runs the hospitality group at our parish) faces. Currently, the ushers at our parish are a tight knit group and have literally made it an exclusive club. They rarely allow new blood in there. It’s as though they feel threatened by outsiders. It’s somewhat understandable, but if there were a rep at each mass, that might stem that attitude.